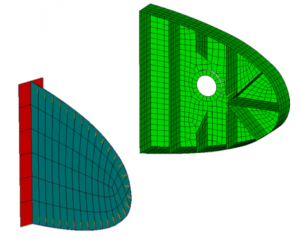 Welcome to the fourth part of our Femap in Aerospace series. In this post we cover a well-known challenge in the industry: Dealing with large models. Despite advanced technology and powerful computers, one of the major issues with FEA is still the time it takes to run an analysis and the amount of memory it needs. With a coarse mesh you will get a reasonable idea of the behavior of the structure. But in some areas you’ll need a more refined mesh to obtain relevant detailed results. Current technology lets you pull in a complex CAD assembly, put a fine tetrahedral mesh on it, set up automatic connections and let it spin for a few hours. However, when it comes to sensitive analyses or what-if scenarios you’ll notice the complexity of your work has increased dramatically. Who has time to work with a million or more nodes model? Debugging, run times and data management will become long, tedious and prone to error. A solution to dealing with large models is a global/local modeling process. It lets you create a global model and integrate more detailed local models in places of interest. This way you can model the areas you need while still under the constraints and loads from the global free body diagram. You can mesh and analyze the local model, and then merge it back into the global model. So in short: Global / Local modeling is a general topic where results from a global system or coarse model are applied as boundary conditions to a more refined model of a component or subsection of the global model. In Femap, the global / local modeling process is streamlined and simplified with the free body tool. Components of interest in the coarse model are represented by separate more detailed models and loaded using the free body loads taken from the coarse model which simulate the surrounding structure. It starts with a coarsely meshed global model, where the component that is to be modeled with greater refinement and represented by a local model, is identified and the global free body for that component is calculated. In this example it’s one of the ribs of the global wing model. 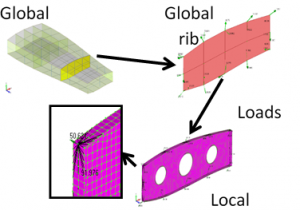 A more detailed local model of the same rib is created, and the loads from the global free body are applied to it. However, as the local model has a completely different mesh and node positions, the loads are applied to the more refined model using rigid elements. Let Femap’s efficient modeling approach help you reduce the risk of error. Like to know what Femap can do for your company? Please contact us! We as Femap supers users will be happy to help you any way we can. Follow us on LinkedIn, Twitter or Facebook for more posts like this! More Femap in Aerospace Visit our Femap page Contact us!